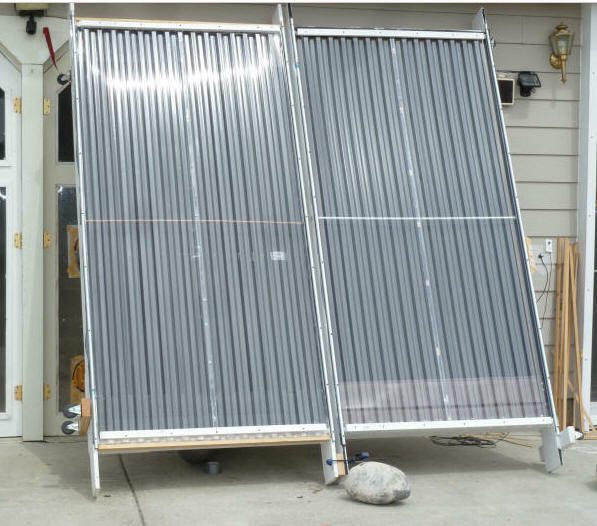 Build-It-Solar Blog: Solar Air Heating Collector Testing -- Which DIY Solar Collectors Perform the Best? 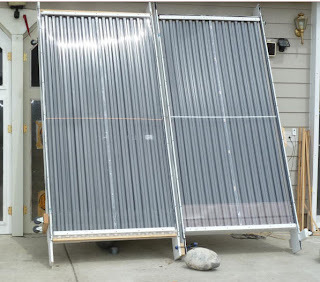 Solar Air Heating Collector Testing -- Which DIY Solar Collectors Perform the Best? DIY solar air heating collectors for space heating can offer the best bang for the buck of any solar project I know. These collectors are simple and cheap to build and can have payback periods as short as one season! They offer a particularly attractive option to the Do-It-Yourselfer -- commercial solar air heating collectors with prices pushing $2000 can literally be built as DIY projects for $200! One of the biggest questions facing someone wanting to build one of these collectors is to decide which of the many collector designs out there to build. Its fairly easy to look at the designs and evaluate construction difficulty and cost, but the big missing factor is the efficiency of each design. Scott and I have been doing a winter long set of testing on some of the common DIY solar air heating collector designs to try and get a handle on comparative performance. We have adopted the approach of building full size prototypes of each collector design. These prototypes are identical except for the absorber and inlet and outlet details that make a design unique. We then test two of the collectors side by side such they both see the same sun, ambient temperature, wind, etc. In these tests, one of the two collectors is always the standard baseline design, so each new collector is being compared to the same baseline design. This procedure makes it much easier to get a true comparison of the various designs. Blower and airflow measuring setup for collector testing. As it turns out, one of the simplest collector designs did very well, so you can have simplicity and high performance with the same design. This is a tentative ranking of the collectors from best overall down based on the testing that was done. I ranked this the best because it has a great combination of high performance, low cost, and is a very easy build. This collector also has a low pressure drop which means a smaller (maybe quieter and cheaper) fan can be used to drive it. The screen collector surprised both Scott and I -- we initially included it because it is easy to build, and the thinking was that even it is not up to the performance of some of the others it might be a winner in low cost and easy build. As it turns out, none of the other collectors did better in performance. Performance rating: base -- this was the best performer and is the base for performance drops shown below for the other collectors. In the performance area, this collector was basically tied with the screen collector, and there may be further optimizations that could be done to improve its performance from what was tested. Its a relatively simple build, but harder and more expensive than the screen collector. The pressure drop through this collector is low (which is good). While this collector did not perform as well as the screen collector, I would hold off on judging performance until a more optimized one can be tested. On the negative side, its the most expensive of the collectors listed here to build, and its not clear (to me) exactly what needs to be done to the design to get a more even flow distribution. The pressure drop through the collector is low (which is good). The downspout collector appears to be well suited to long narrow collectors that might be difficult to do with a screen or soffit collector? Performance rating: In my test, 40 to 50% off the screen collector, but my downspout collector was not optimized, and can improve. This is the old standby design that has been popular for many years. The version that we tested turned out to have performance that was not as good as the screen collector. The backpass collector had the highest pressure drop of any of the tested collectors (which is bad). There are a lot of variations possible on this design, and its certainly possible that other versions would do better. Performance rating: About 10 to 20% off the screen collector. Optimization of the baffles would improve the backpass collector. This one certainly is the winner on ease of build and cost -- its literally an empty black box with air blown through it. Testing it sort of answers the question I get a lot saying "Why not just build and empty black box and blow air through it? " The answer is that you can do this, and it works, but you are giving up a lot of performance compared to other designs. Performance rating: About 50% to 60% off the screen collector -- that is, adding two layers of window screen roughly doubles the heat output! These results agree with Scott's tests with the exception of the downspout collector, which Scott did not have a chance to do a side by side test on. I think that it is significant that we were able repeat each others results with completely independent test setups. None of these collector designs has been optimized for best performance. They can all likely benefit from design refinements -- some likely more than others. Coming up with a good method to measure airflow accurately in order to insure that the two collectors being tested side by side were getting the same airflow proved to be very difficult. The methods used included: time to inflate a large bag of known size, velocity measurements with a Kestrel turbine style anemometer, using the flow generated voltage of PC fans in the collector flow, a hot wire anemometer, and pitot tubes to measure. The methods changed from test to test, and the fact that some of these methods have an unknown amount of error introduces some uncertainty into the results. The original plan was to identify one collector design as the baseline, and to include this collector as one of the two collectors in each side by side test -- this way each new design was always being compared to the same baseline design. The original choice for the base collector was the backpass collector. But, after testing the screen collector and seeing how well it did with such a simple and easy to build design, we decided to change the baseline to the screen collector -- this makes it easier for anyone who wants go join in this testing to do so. But, this again introduced a bit of uncertainty in the test program. The weather was different for each test, so basically each pair of collectors was tested on a somewhat different part of its efficiency curve. This was one of the main reasons for always including the baseline collector in each test. I did attempt to do each test on a clear day with outside temperatures that are typical of real winter conditions (the downspout collector test was the one exception with a fairly high 49F ambient temperature). One final note on the testing is that as a sort of check on the whole process, I built a 2nd screen collector that is the same as the first one. I tested the two screen collectors against each other in a side by side test. I used the same setup, blowers, flow measurement techniques as are described above for all the other tests. So, this is a check on the whole side by side method of testing and on the instrumentation. The difference in heat output between the two was 3%. Of course, if both collectors were completely identical and the instrumentation, flow rate setup, ... were exactly the same for both the heat output difference would have been 0%. I guess that one message here is don't be looking at differences of 2 or 3% as significant -- these kinds of differences arise from small differences and construction and measuring techniques. I'm probably going to do more testing next winter with an eye toward repeating some of these tests with a better airflow measuring setup, and then (hopefully) get into some changes to improve the design on some of them. No one's chimed in yet, so I guess I will. You've taken solar collector testing from "I stuck my hand over the vent and it was really, really hot" to differences of only a few percent. Thats huge. I'm not sure it needs to go much further since cost, ease of construction, and the ability to add an extra 2 feet to the collector makes small differences less important. I think more might be accomplished with tweaking the designs a bit. For instance, How much more would you get from the screen and soffit collectors if the air had to go through the collector material several times instead of once? How much would the downspout collector performance change if the air was spiraled or turbulent inside it to disrupt the natural tendency to stratify? I'm pretty sure I'll be putting 3 screen type collectors in this summer and your site is solely responsible for inspiring me to try it. You make it seem so simple and cost effective that I don't know why I haven't done it sooner. I would like to see some more info, or links to information about good fans/blowers to use, how to hook them up, shutters and other nuts and bolts considerations. Good point on putting together some material on the fans, controls etc. needed to finish out the air collectors. Will see what we can do about that. I worked for Solar Shelter Engineering in 1979-1981. Our air heating collector was by far the most efficient on the market at that time. Since there hasn't been much recent air panel development, I'd venture to say that it was the most efficient design ever. So in order to understand what the upper efficiency limit of a home-built air collector, you could study the patent to understand the panel's construction details. It used two panes of low iron tempered glass, so the weight of this design makes it fairly impractical. But it was durable, you still see these panels all over Denver. A phone call to the SRCC might also get you a copy of the test report. The "y-intercept" was 0.82.